Today, I read to my 18-month old the story of the Lazy Donkey. I also plan to read the same story to my three boys tonight before bedtime. There are times they prefer to be like the lazy donkey. I would want them to know what happened to the poor animal because of its dishonesty. Khandya learns his lesson and starts behaving. I found out yesterday that my 13-year old boy is hesitant to carrying his lunch bag. So he would leave the bag in my mom’s car every morning and put his packed meal inside his school backpack. If his food has a heavy sauce, he will leave it in my mom’s car again. He either buys food at the school cafeteria or prefers not to eat lunch. Out of frustration and also to teach him a lesson, I told him that beginning this morning I will no longer wake up early to prepare food for him. I will not give him money either to buy food. Faithful to my words, I woke up a little late. I saw him reheated a leftover and ate in silence. He also filled his small jug with water and left when my mom beeps her horn repeatedly to signal that she’s there. We haven’t talked yet. He could use his savings or ask money from my mom to buy food. I just want him to appreciate my effort of waking up early to prepare his breakfast and school lunch. I also felt betrayed. But then, I also understand his concern. He feels embarrassed carrying a lunch bag with him. He does not like it either when I use plastic spoon and fork for him. He is in High School already, and image is important to him. I have seen how he dresses and how he puts effort to make himself presentable. Anyway, I hope as he returns home from school today, we will settle this little misunderstanding. I just hope he approaches me first. Or is it my pride already? I need some advice from you, please. As a mom we need to be firm but we need to be gentle as well, as I remember one of our teachings, we are more mature so we need to adjust and approach to them and explain in a gentle way on a one on one basis. It’s better to love than to be right sometimes, to show them they right way. Just my thought. But you know better than I when it comes to your child. So just feel free what you think will work. I can just imagine how challenging it is to raise a teenager (or are they tween?). I have yet to experience that but I know one day I will. And suddenly, there will be a day that I will not even understand Nate’s likes and dislikes anymore. Hugs to you. I know everything will be okay. Yes, it can be real intimidating and difficult especially if he is already a teenager. I hope we were able to patch things up. He is using his lunch bag now and I hope he isn’t hiding anything from me. But more than that, I still thank for this incident. At least I was able to understand and again recall how it is to be a teenager. I couldn’t imagine how it is to be a parent, specially when the kids grow up, and specially teenagers (I can imagine it gets really difficult by then, because I was a difficult teenager myself). One of the things I’ve noticed during the time I was a teenager, was that I felt a bit misunderstood by my parents, because of the lack of communication. So they’d chose to punish me instead of sitting down with me and explain why they didn’t agree with something in particular I’ve done. So during my teenage years, I’ve gained the habit of hiding many things from my parents because I simply felt they wouldn’t ‘understand’. In your case, I know you understand your child, but at the same time, you want him to understand your point too. I completely understand that, and I also understand the benefits of being firm. Also, depending on the child, some of them will react better or worse to a certain approach (so only you know your kid better than anyone to know what approach would work better with him). In my case, as I’ve mentioned, it would have worked better if my parents had tried to communicate more with me, would have made me open a bit more with them and tell them more things (instead of hiding). Basically I believe that in the end, regardless of the method you chose, the most important is that they’re aware of what they’re doing wrong, and having the ability of stopping doing it because it’s wrong, not because they’re being punished or there’s an immediate consequence associated to it. thank you for dropping by and sharing a part of you. My mom used to punish me as well. I hide a lot of things from her as well. I have seen the not so good side of this thus as much as possible, I try to communicate with my boys. It is reassuring as well that I have a husband who talks to my kids should I ask him to. Sometimes, I feel that it is better that it is my husband who disciplines the boys. They are both males and perhaps understand each other better. Great story, great lesson. One thing I would omit is beating the donkey. LOL. I like the way you disciplined your kids. Far too often, parents make threats but fail to act on those threats. Kids learn how to ignore those threats. The flip side to this is to be sure not to make threats that cannot be carried out, and even so, it should be well within limits. I like to think of that as showing them the consequence of their actions. 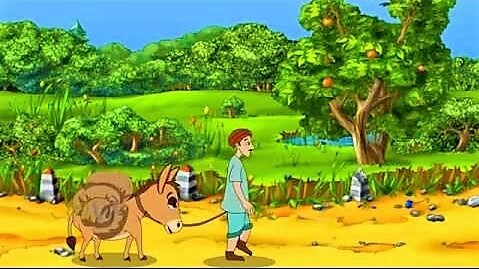 The story about the lazy donkey is a true wisdom. Being a parent is one of the greatest challenges in life, and every our step is equally important and influences the behavior of our children. I am really not sure what I would do in such a situation, but I support you being a firm mom. Good luck with raising your children. Thank you. Need all the good lucks. 🙂 Yes, I agree on that. Every step or decision we make as parents may greatly affect our children. Caution is still needed.